Looking for that ideal San Diego home for sale with ocean breezes, easy living and huge views in all directions? 970 N Stage Coach in Fallbrook is that rare listing that will literally blow your socks off and force your feet into flipflops. That’s what a Tommy Bahama home would look like to me. This gorgeous single story custom pool home has been pampered to the hilt with luxurious upgrades and extras that we can only begin to describe. Photos just don’t do it justice! 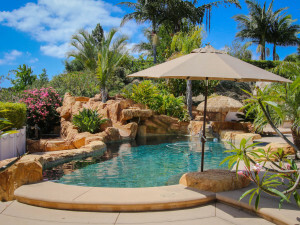 Sitting on almost 1.5 scenic and very private acres, you are surrounded by plumerias, flowers, fountains and palms. There is also plenty of room if one wanted a hillside grove of avocados or citrus trees. 970 N Stage Coach is a paradise for both adults and kids of all ages. The pool and spa are solar heated, making for year-round enjoyment of not only the montain views beyond, but the gorgeous pool, slide and grotto area. The pool’s solar heater is less than 2 years old. The grand wooden Tiki, hidden in this pool photo (as is the slide and grotto), is included in the sale and pool equipmene is tucked away in its own building. The major appliances are almost new with a Sub-Zero refrigerator, LG dishwasher, Dacor Induction Cooktop (beats gas and electric!) and Dacor double oven that conveniently goes online so you can check email. There is also a built-in wine fridge, newer Sharp micro, large pantry, beautiful granite surfaces and wood cabinetry. The large en suite master with fireplace, huge closet and exterior door sits at one end of the home–distant from the other two bedrooms, laundry and garage. The main living area is open with fireplace and wall-mounted television, while dining room overlooks the pool and outdoor kitchen (with huge bar, grill, cooktop and icemaker). There are also two flexible and sizable office or den areas–one off main hallway near entrance and the other off the dining area. The 2 secondary bedrooms are large and located opposite the master bedroom. Almost new automatic interior blinds and exterior sun shades in the living area are controlled with a single programmable remote. This home lives almost off the grid. 100 percent of the electricity is provided via an expansive array of solar panels on the tiled roof. The system is leased (and assumable for buyer) via Sungevity and runs $292.45 per month. The owners, who run most of the home on electricity, run a credit with SDG&E each month. The front door has been recently inlaid with leaded glass palm trees–adding to the tropical flair.The main living areas and hallways are floored with oversized granite and the sellers are offering a credit to replace bedroom carpeting which has been much enjoyed by a couple of rescued dogs–one of whom is blind. These kind owners wear halos from the rainbow Bridge. There are 3 outbuildings–one an original that has lots of possibilities and two other Tuff Sheds, recently added by the owners. One is 8 x12 and the other 12×20. And a big bonus? A really cool 4 passenger golf cart with lights and a trailer hitch that will tote garbage cans to the street. The amazing price for this custom beauty? A current and reduced bargain at $799,000! For additional information or a private showing, please call Roberta or Scott Murphy at 877-818-8197 or 760-402-9101. Short Sale! Spacious Single Level Santa Barbara Style home located in the highly desirable Morro Hills area of Fallbrook. Cool Ocean Breezes, Private Roads, quiet Cul-de-Sac location on approx 2.1 acres. This home needs lots of TLC. 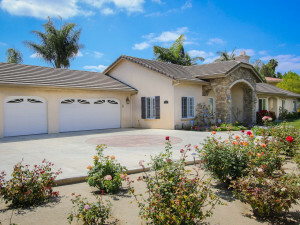 Based on information from California Regional Multiple Listing Service, Inc. as of April 23, 2019 22:54 and/or other sources. All data, including all measurements and calculations of area, is obtained from various sources and has not been, and will not be, verified by broker or MLS. All information should be independently reviewed and verified for accuracy. Properties may or may not be listed by the office/agent presenting the information.